Saving water at home is not only an environmentally friendly effort, but it can also save you money. The facts about home water usage are surprising. For example, a bathroom faucet runs at about two gallons per minute. A leaky toilet can waste up to two hundred gallons a day. The Environmental Protection Agency says a family of four will use more than 300 gallons a day. Most everyone pays for their water usage, and even if you don’t, the earth will thank you for using these 8 tips to save water at home. Stop letting water go down the drain unnecessarily. When brushing teeth, tell family members to turn off the faucet after wetting their brush and don’t turn it on again until it’s time to rinse. Follow the same procedure while scrubbing your hands. It sounds insignificant, but it adds up over time. Has your water bill suddenly skyrocketed? Check all faucets and toilets for leaks, If you don’t see any, it could be the water line. If you can’t fix your own leaks, call a plumber. The savings on water will eventually pay the bill. Instead of dumping pasta water and other cooking water down the drain, catch into a larger pot and set it aside. Use it for watering plants after it cools down. 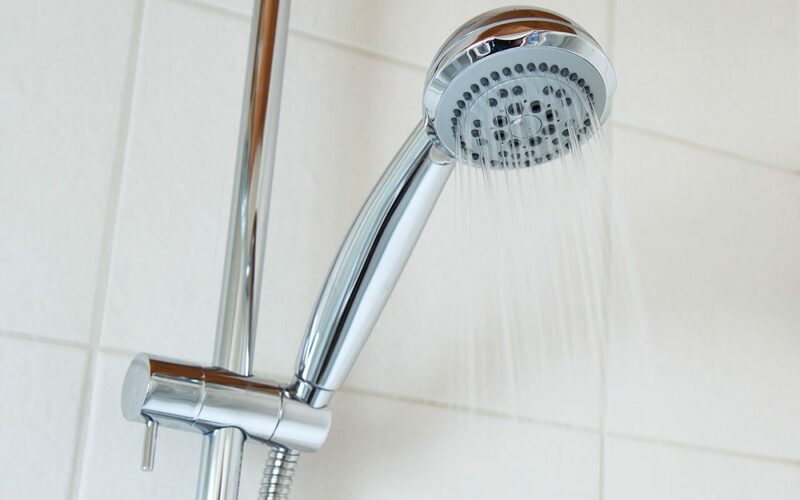 Your showerhead may use as much as three gallons of water a minute, especially if it’s an older one. Save water at home by taking shorter showers. Limit showers to five minutes or less and ask your family members to do the same. You can set a timer to keep track of the time or listen to one or two songs through a waterproof speaker for a more fun option. Save water at home by changing out old showerheads for the newer efficient ones. A WaterSense showerhead must use less than two gallons per minute. Change to a low-flow toilet. Replace the dishwasher and washing machine with the new WaterSense-rated ones. Your initial investment will add up to big water savings. Wait until the dishwasher or washing machine is full to wash a load. A half-load of clothes or dishes wastes gallons and gallons of water. If you’re shopping for a new washing machine, keep in mind that high-efficiency front-loading washers use less water than top-loading ones. Either way, look for an Energy Star® certified model. Catch rainwater in a barrel for watering the garden and other outdoor chores. Depending on rainfall, you could keep plants hydrated well enough to avoid turning on hoses or sprinklers, especially if you only water in the morning or after sundown to avoid evaporation. You can save water at home by using less electricity. Power plants use thousands of gallons of water for cooling purposes. If you look for ways to reduce energy use, you’ll indirectly save water. Olde Son Home Inspections serves Eastern Massachusetts with home inspection services including water testing. Contact us to schedule an inspection.